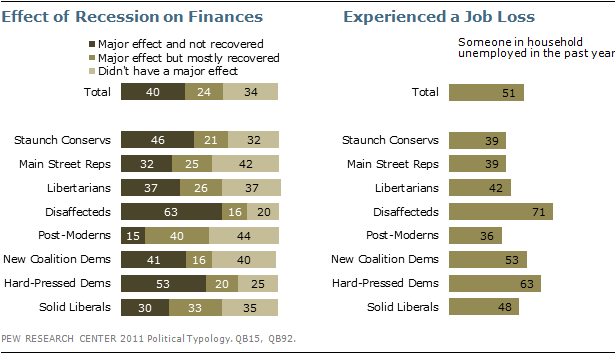 The Great Recession has had a major impact on certain segments of the political typology. The varying levels of financial stress that different groups face play a role in shaping their views on issues and policy debates. Beyond the recession’s tangible impact, there are differences in the economic outlook of different segments of the electorate. New Coalition Democrats were hit hard by the recession, but remain fundamentally upbeat about their personal financial situation and future. Others, like the Disaffecteds and Hard-Pressed Democrats, have a far more skeptical outlook. Disaffecteds, Hard-Pressed Democrats and New Coalition Democrats stand out from the other groups in their level of personal financial stress. Fully 83% of Disaffecteds, 68% of Hard-Pressed Democrats, and 57% of New Coalition Democrats say they often don’t have enough money to make ends meet. The other groups do not generally struggle to make ends meet. Two-thirds or more in the five other typology groups say paying the bills is generally not a problem. In particular, the predominantly independent Post-Moderns have emerged from the recession largely unscathed. Only 15% of Post-Moderns say the recession had a major effect on their finances that they have not yet recovered from, well below the 40% of Americans overall who say this. Four-in-ten Post-Moderns say they have mostly recovered from the recession, and 44% say the recession didn’t really have a major effect on their financial situation. Two of the groups were hit particularly hard by the recession and are still struggling. Majorities of Disaffecteds (63%) and Hard-Pressed Democrats (53%) say the recession had a major effect on their personal economic situation and their finances have still not recovered. Further evidence of the recession’s impact on these typology groups is in their reported experiences with unemployment; 71% of Disaffecteds and 63% of Hard-Pressed Democrats say they or someone else in their household has been out of work and looking within the past year. While most New Coalition Democrats live on tight budgets, and more than half have faced unemployment in their household this past year, they are far less likely than these other financially pressed groups to see the recession as a major factor. Just 41% – about the national average – say the economy had a major effect on their finances that they haven’t recovered from. Most say they either got through the recession unscathed (40%) or were hit hard but have recovered (16%). Roughly half of Disaffecteds, New Coalition Democrats and Hard-Pressed Democrats have household incomes below $30,000 a year. Fewer than a quarter in any of the other five groups are in this income range. But the employment situation across the three lower-income groups differs widely. Just 36% of Hard-Pressed Democrats are currently employed – fewer than in any other typology group; one-in-five (21%) are currently unemployed and looking for work. By comparison, roughly half in the other financially stressed typology groups – the New Coalition Democrats and Disaffecteds – are working. 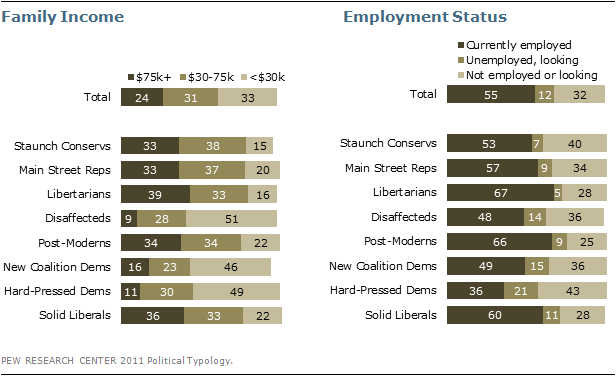 Libertarians and Post-Moderns have the highest employment levels among typology groups, with roughly two-thirds of each group currently working. While three of the typology groups – Disaffecteds, Hard-Pressed Democrats and New Coalition Democrats – face significantly higher economic stress than the others, what sets New Coalition Democrats apart is their financial optimism. About a third (35%) of New Coalition Democrats say they currently have enough income to lead the kind of lives they want, compared with just 10% of Disaffecteds and 19% of Hard-Pressed Democrats. This contrast is just as stark in terms of pessimism about the future: Roughly half of Disaffecteds (51%) and Hard-Pressed Democrats (47%) say that they will probably never have enough income to lead the kind of lives that they want. Only a quarter (26%) of New Coalition Democrats are so pessimistic. Half or more in each of the five typology groups with higher household incomes say that they currently have enough income to live the kind of life they want. 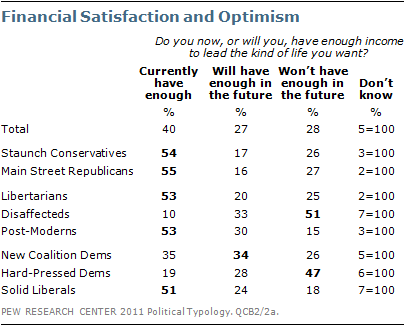 Among these groups, Post-Moderns are the most optimistic about their long term economic outlook. Three-in-ten (30%) Post-Moderns say they will someday have enough income to live the kind of life they want; while just 15% say they won’t have enough in the future. Among the other four groups, this balance is more even, if not negative. A majority of the public (62%) says most people can get ahead if they’re willing to work hard while 34% say hard work and determination are no guarantee of success. A clear majority of the core Republican groups as well as Libertarians and Post-Moderns think that most people can get ahead if they are willing to work hard. New Coalition Democrats also are more likely than Hard-Pressed Democrats and Disaffecteds to say that people who work hard can get ahead. By a two-to-one margin more New Coalition Democrats say people can get ahead if they work hard (64%) than say hard work and determination do not guarantee success (32%). Hard-Pressed Democrats and Disaffecteds have a much more divided view with only about half saying hard work can guarantee success. Solid Liberals are among the most skeptical that everyone has it in their power to succeed in life. Half say hard work and determination are no guarantee of success, while 45% say most people can get ahead if they are willing to work hard.